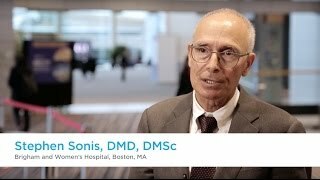 Stephen Sonis, DMD, DMSc of Brigham and Women’s Hospital, Boston, MA discusses cancer supportive care and its importance for cancer prognosis in the future. Incidence of cancer is going to increase significantly in the next 25 years, but prof Sonis points out that survivability is going to increase too, although that depends largely on patient’s location. In developed countries the gap between survivability and mortality is getting better, which means that supportive care deals not only with acute toxicities, but also with toxicities which continue through survivorship. Recorded at the Multinational Association of Supportive Care in Cancer (MASCC) and International Society of Ocular Oncology (ISOO) 2016 Annual Meeting on Supportive Care in Cancer held in Adelaide, Australia.